By now, you’ve probably seen the images on Twitter or Facebook of Spanish police in riot gear breaking a Catalan woman’s fingers, beating people as they sought medical attention, and even battling firemen. The shocking violence came as Spanish authorities tried, in vain, to block the referendum for Catalan independence from taking place yesterday. 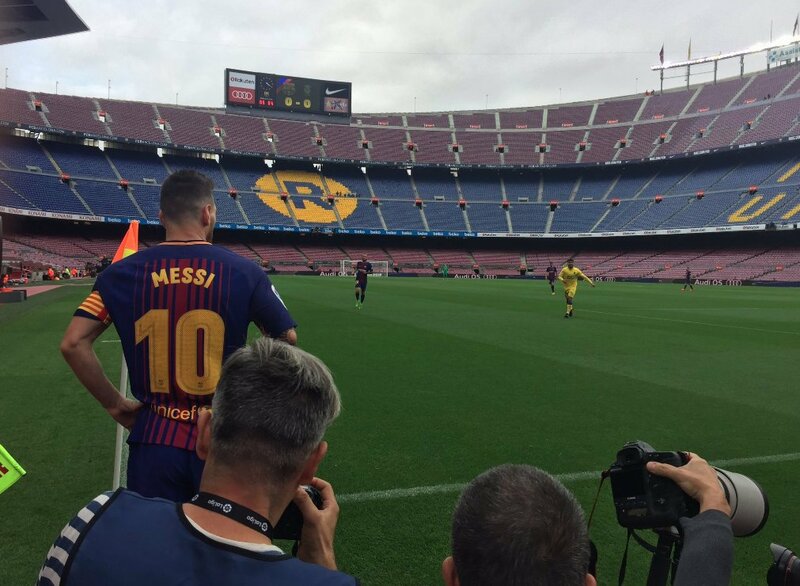 Amidst the chaos, FC Barcelona decided to play its match against UD Las Palmas in an empty stadium. It was an eerie sight in what will undoubtedly go down as one of the saddest days in the history of Spain. First, a brief disclosure: I’m a dual American and Spanish citizen. Half of my family is Catalan, and half is Castilian. I am also a lifelong fan of Real Madrid. All of this has led to a good amount of awkwardness. I’ve watched as both camps have ratcheted up the rhetoric, saying increasingly ugly things about the other side. I’ve long felt that the acrimony has reached a level that will be hard to come down from. Some yell “Democracy!” while others yell “The Constitution!” in an attempt to elevate what is essentially a conflict of pure and unbridled nationalism to one of high-minded principle. The financial crisis of 2008 unleashed a resurgence of xenophobia all over Europe that has caused millions to turn against immigrants. But in the midst of the worst economic crisis in decades, Spaniards haven’t turned against immigrants—they’ve turned on each other. The two sides were on a collision course for weeks. On September 6, the government in Catalonia officially announced that it was going to call a vote on independence on Oct. 1, and should the independence side win out, the government would declare a unilateral secession within 48 hours. The central government in Madrid said that the vote itself violated the constitution and that it would do everything in their power from allowing it to happen. Neither side blinked. And on Sunday, the whole thing exploded. As always in Spain, sports and politics were thoroughly intertwined. It may seem silly to American sports fans, but the question over what would happen to Barca should Catalonia secede was a relatively important one in a lot of people’s minds. Would they be able to still compete in La Liga if Catalonia became an independent nation? Javier Tebas, the president of the league, said no way. Barcelona, meanwhile, has argued that there are precedents they could use, such as the fact that AS Monaco competes in the French League even though they are an independent principality. Not allowing Barcelona to compete in La Liga is a threat of mutually assured destruction. Without Barcelona, and the classic rivalry with Real Madrid, there simply would be no international interest in the league. But it would also mean the death of Barca as we know it, as no one would care about a team that had to compete every week against the likes of Nastic de Tarragona and Unió Esportiva Castelldefels. As violence erupted on the streets on Sunday, the club’s brass met to decide whether or not they would play their home match against Las Palmas. The league threatened to dock them six points should they unilaterally postpone the match. Ultimately the club decided to play the match, but to not allow any fans in the stadium. They cited the players’ desire to play (presumably, they didn’t want to harm their title chances). 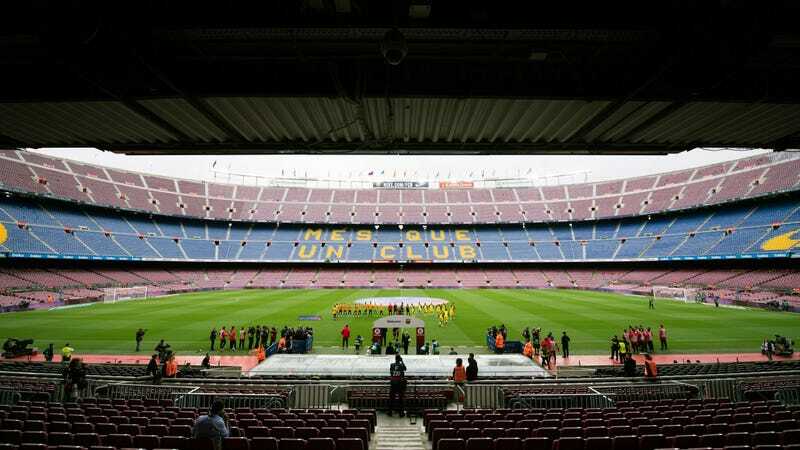 Barca’s president Bartomeu claimed that the decision to play behind closed doors was meant as a sign of protest, to bring attention to what was happening in Catalonia. Many suspected, however, that the club was worried that the fans would rush the field in protest. Barca won the game 3-0, with two goals and an assist from Leo Messi. Even as the world burns some things remain constant, and one of those is Messi’s droning greatness. It’s hard to disagree with him. The world is appalled with videos such as this one, where policemen brutally beat people who were clearly no threat to them. But Pique, perhaps more than anyone else, has become the personification of this bitter culture war. He’s one of the few athletes that is unafraid to speak his mind, and he’s been punished for it. For years he’s been booed all over stadiums in Spain. Now it seems like his position on the national team is untenable. He said that he would like to continue playing for Spain—that it’s not a “competition in patriotism”—but that if the coaches or the federation wanted to cut him from the team he would gladly step aside. And I can’t help but think that that’s where nationalism gets us. Pique is a great player, easily one of the top 5 players in the world in his position. His record for Spain is impeccable. He was a key member of the side that won the World Cup in 2010 and the European Championship in 2012. Despite this, we’re at a point now where Spain may willingly remove one of the best players in the world over ... what? Lack of patriotism? The absurdity is evident. But that’s where Spain finds itself now. Just like it will gladly own itself by forcing a great player off the team, they are owning themselves with the violent reaction to Catalonia’s vote. The violence almost certainly pushed many more Catalans farther away from Spain. This, of course, is a canard. Constitutions aren’t ordained by a god in heaven. They are political documents and should be allowed to reflect political realities on the ground. And if you’ve spent any time in Catalonia lately, it is obvious that the energy is with the independence movement, and it grows with every authoritarian move coming from Madrid. This is not the discourse of liberating emancipation. That’s just good old-fashioned conservatism, which is what nationalism always bends toward. Indeed, the ruling party in Catalonia, which is driving the independence push, is borne out of the traditional Catalan party Convergència i Unió, which was always a fairly typical center-right “business-friendly” party. They’re in a ruling coalition with an anti-capitalist party known as Candidatura d’Unitat Popular (popularly known as CUP). To get an idea, imagine Mitt Romney and, say, Jill Stein in the same political alliance. The only thing that binds them is a shared sense of nationalism. And that should give everyone pause. Nationalism is, typically, a force for destruction. Every basic middle-school history textbook will tell you that World War I was fought over vague ideas of “nationalism.” Indeed, many of the socialist parties in Europe saw their credibility with the working class collapse when they supported the war effort. The chairman of the Social Democratic Party in Germany defended his party’s support for the war by saying “We will not desert our fatherland in its hour of need.” That is what nationalism does. It causes you to abandon principles in favor of ugly resentments and reaction. It brings out the most violent and hateful side of our humanity. A hundred years ago, it led to the senseless mass slaughter of millions of Europeans. We won’t see that level of violence in Spain today, but we have seen how nationalism has led to millions of Spaniards tolerating a degree of repression that they would’ve found unacceptable just a few years ago. As of this writing, at least 800 people were injured on the streets. As the president of Catalonia continues his push for unilateral secession in the wake of the vote, it’s unclear what is going to happen. No one expected this level of state violence on the day of the vote. What would secession trigger? Tanks on the streets? Nobody knows at this point. Nando Vila is the host of Gimlet Media's "We Came to Win", a podcast about the hidden stories behind the World Cup's greatest moments.